Diamond Dies also known as PCD dies are used in the wire drawing of Copper, Aluminium, Brass, and smaller diameters of Stainless Steel Wires. We at Regal Carbide Dies Pvt Ltd, are supplying these dies for many years and all our clients are very satisfied with our dies. 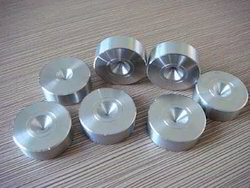 We at RCDPL , are suppliers for Diamond Dies. These dies are made from synthetic diamond , commonly known as a PCD Die. Here PCD stand for Poly Crystallins Diamond. Commonly these dies are used in drawing of copper, aluminium, brass , stainless steels of small diameters and now a days in fine tube drawing. Some of our clients are used Diamond Compacting dies as well. Although the cost of diamond dies is much higher than that of a tungsten carbide dies, still in the long run these dies are cheaper as the cost per tonne of the wire is lower in case of PCD dies than in a normal carbide die. Please feel free to contact us for all your diamond dies or carbide die needs. Looking for Diamond Dies ?